West Windsor, N.J. – It’s the early 1980s and an unidentified disease is killing off an oddly specific group of people: gay men, mainly in New York City. Students in the Mercer County Community College (MCCC) Theatre Program present the Larry Kramer drama “The Normal Heart” at MCCC’s Studio Theatre Friday, Dec. 5 at 8 p.m., Saturday, Dec. 6 at 2 p.m. and 8 p.m.; and Sunday, Dec. 7 at 2 p.m. The Studio Theatre is located adjacent to Kelsey Theatre on the college’s West Windsor campus, 1200 Old Trenton Road. Recently adapted into an HBO film, “The Normal Heart” is a searing journey back to the dawning days of the AIDS epidemic. It focuses on Ned Weeks, a writer and gay activist based on Kramer himself. Recognizing that a deadly illness is overtaking his community of friends, Weeks struggles to pull together an organization to raise awareness and promote action. His cause is furthered by Dr. Emma Brookner, a physician whose patients are increasingly falling victim to the mysterious outbreak. Weeks’ relationships with friends and family are tested as he and other activists look within their community and then to politicians and the press to provide support and funding for research. Featured in "The Normal Heart," from left, Mariah King, Madison Kotnarowski, Tristan Takacs, Jonathan Polanco and Nicholas Andrejco. “The Normal Heart” premiered off-Broadway in 1985. It enjoyed a Broadway revival in 2011 that was nominated for five Tony Awards. MCCC Associate Professor Jody Person, Coordinator of Theatre Program and the play’s producer, observes that the play presents a very real treatment of a dark time, an era that demanded leaders and answers. “The students are fully engaged in telling this dramatic story, which is based on those at the center of the AIDS storm. Some of those people lived – but many of them died. Most of our cast members were not born when the AIDS epidemic first surfaced, so the play serves as a history lesson as well,” Person said. According to director Bob Terrano, the cast is a joy to work with. “This is an emotionally demanding show that requires the actors to portray their characters clearly while conveying multiple layers and feelings. Rehearsals are draining but the cast springs back each time with energy and dedication. The actors are committed to accurately depicting the sense of urgency, fear and anger that so many gay men experienced at that time," Terrano said, adding that he is dedicating the show to his cousin, Nelson, who lost his life at 31 in the early '80s to HIV/AIDS. The cast features Charles Acuna of Plainsboro as Hiram Keebler/David; Nicholas Andrejco of Ewing as Ben Weeks/Ned Weeks (alternate performances); Jonathan Cintron of Trenton as Mickey Marcus; Jovan Griffin of Ewing as Craig Donner/Orderly; Michaelyn Haley of East Windsor as Emma/Examining Doctor (alternate performances); Dan Johnson of Ewing as Bruce Niles; Mariah King of Jersey City as Emma/Examining Doctor (alternate performances); Madison Kotnarowski of Trenton as Grady/Orderly; Jorge Martinez of Trenton as Tommy Boatwright; Jonathan Polanco of Hamilton as Ben Weeks/Ned Weeks (alternate performances); and Tristan Takacs of Hamilton as Felix Turner. The production team includes director Robert Terrano, producer Jody Person, costume/set designer Kate Pinner, lighting designer Star McCloud, light board operator Chris Nielson, sound designers Evan Paine and Eric Collins, stage manager Amanda Suchil, assistant stage manager Megan Haltmeier, and make-up artist Koren Zander. 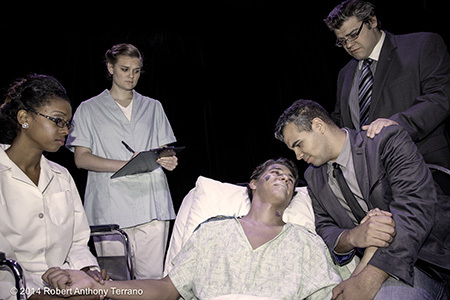 Tickets for "The Normal Heart" are $18 for adults, $16 for seniors, and $14 for students. (Tickets for MCCC students with current IDs are $8.) Tickets are available online or by calling the Kelsey Theatre Box Office at 609-570-3333. Kelsey Theatre is wheelchair accessible, with free parking available next to the theater. Students interested in Theatre and Dance at MCCC may pursue their associate degrees in either Liberal Arts or Fine Arts. Read more about the Theatre/Dance program here. For additional information about community performances at Mercer, visit the Kelsey Theatre website here.